Soon, Norwegian fjords are going to boil as huge shoals of mackerel chase sprat into shallower waters. ThorNews recommend that you try out this super-tasty and healthy summer recipe. This is a cooking method that has been used in Eastern Norway as far back as anyone can remember. One can of course fry the whole fish but here we have chosen to use fillets. 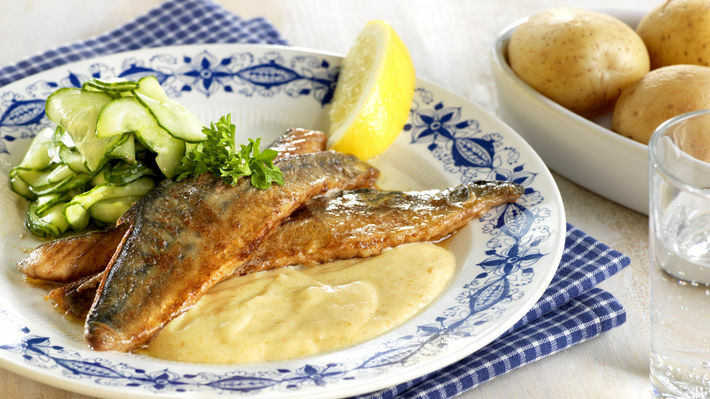 According to tradition the fish is served with sour cream sauce, cucumber salad, lemon and boiled potatoes. 1. Make the cucumber salad at least half an hour before eating. Then it will be at its best. Mix together water, vinegar, sugar, salt and pepper. Cut the cucumber into thin slices and place them in the vinegar mix. 2. Fillet the mackerels. Mix flour, salt and pepper and turn the mackerel fillets in the mixture. 3. Fry the fillets for approx. 2 minutes on each side. If you fry the skin side down you prevents the fillets from twisting. 4. Remove the fish. Sprinkle flour into the pan and add the sour cream. Whisk the sauce and dilute with a little milk or cream to desired consistency. If you do not know how to fillet the fish, we recommend that you ask the people working at the fish counter to do it for you – or you can watch the video below.